Quigley and Carter contracted a third party supplier to send the texts on its behalf, but failed to check properly that the individuals to whom the messages were sent had properly consented to receive them. An important note here is that the ultimate responsibility lay with Quigley and Carter and not with the supplier of the text broadcasting services, regardless of any assurances the supplier may have made about the data or its service. 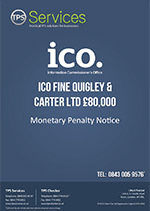 The text messages were directing individuals to Quigley and Carter’s website, www.mybankrefund.com, which offers services to do with mis-sold packaged bank accounts. Thousands of complaints about the texts were made to the ICO and the 7726 spam reporting service.